how would an old image of my main character look alongside a new one? Center Mab is the present incarnation. Right most Mab is Level 65 or so in February 08. I’ve obviously had a haircut and a nose ring added at some point, which I’ve kept until present. I added this guy as he’s wearing my most favourite head gear – Helm of Lupine Grace. Happily this helm is still in my bank, available for mogging – I should do that actually. Quite a few gear changes evident already. Also for some reason they make enhance shammies wear skirts a lot. I don’t know why. Overall, gear is different of course, but always a miss mash of stuff from quests, drops etc. Occasionally something from the AH or something crafted. Surprised there’s no fist weapons here as I went through a phase where I really loved them. Couldn’t be disarmed was a bonus too as it was counted as unarmed. Running as Enhance with Dual Wield is consistent, and the Frostwolves original Tabard can be seen on all three. There was a period in BC and in WotLK where the tabard was changed a couple of times but we went back to this one before Cata. This is the earliest I could find. 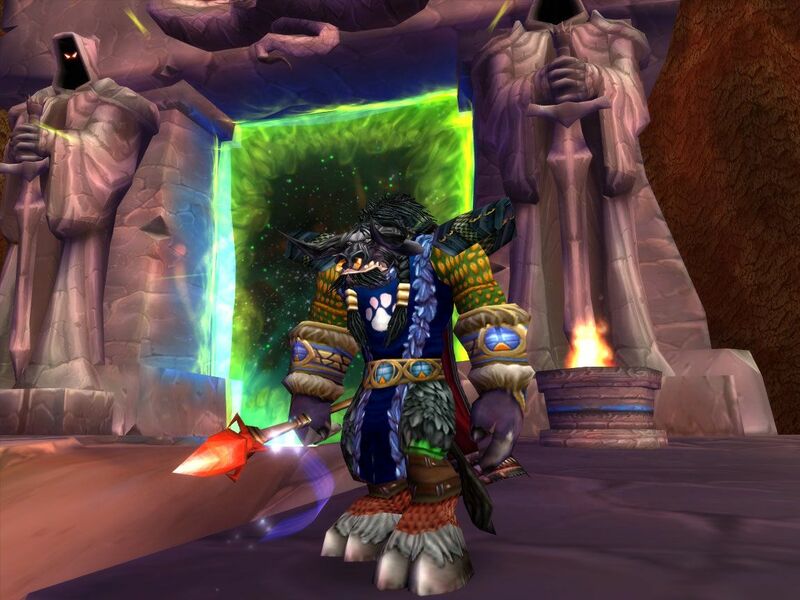 It’s Mab posing on the Azeroth side of the Dark Portal. 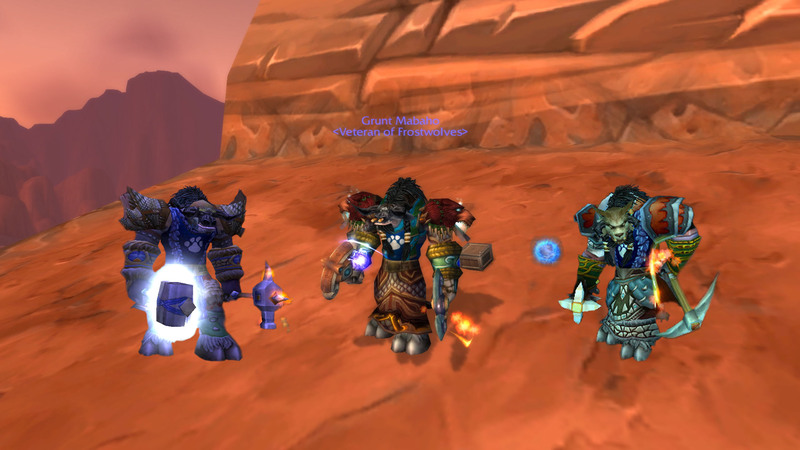 I am level 58, it’s August 2007 and I’m about to venture into Outlands for the very first time. Pretty sure the staff is for show as I’ve always played enhance and that’s always been better Dual Wielding. August was about 7 months after BC had been released. My venture into Outlands went very badly. I was poorly geared in a bunch of quest greens and blues (though those wrists look like dungeon set 1!) and struggled to kill mobs. I also died a lot. I spent a lot on repairs and some mobs (the boars for example) didn’t drop gold, so my bank balance was not doing anything nice. I realise that this is the opposite experience to most at the time. After a short while I had only done a small piece of Hellfire Pass and I was pretty fed up with the way things were (not) progressing. I decided that the only way to level was to return to Azeroth and come back to Outlands when I was 60. Remember BC was a tough jump from questing in vanilla. I understand that even Blizzard have admitted that they had really aimed it at people who had been end game in the period before and were waiting for it to come out. I was not one of those, After the lessons from BC, Blizzard has ensured that each expac has been more accessible. And that’s a whole other topic of contention! I returned to Azeroth and faired much better. I imagine I had also had some gear upgrades as well. From then on I didn’t fair too badly as I made sure I made at least one, usually two levels before moving zone. I had one other lesson… I became determined to be level 70 before WotLK was released. I hit 70 in May 2008 and made 80 before Cata. In both cases I even managed a few pieces of purple to help the transition. I was no longer the poor quester trying to get a toehold in each new expac. Author MabahoPosted on March 2, 2012 March 2, 2012 Categories WoWTags meme, WoW5 Comments on The One that Started it All.